A cow being milked by a robotic voluntary milking system. 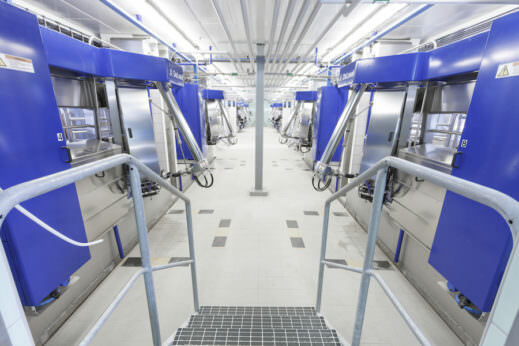 Photography Image courtesy of DeLaval International. 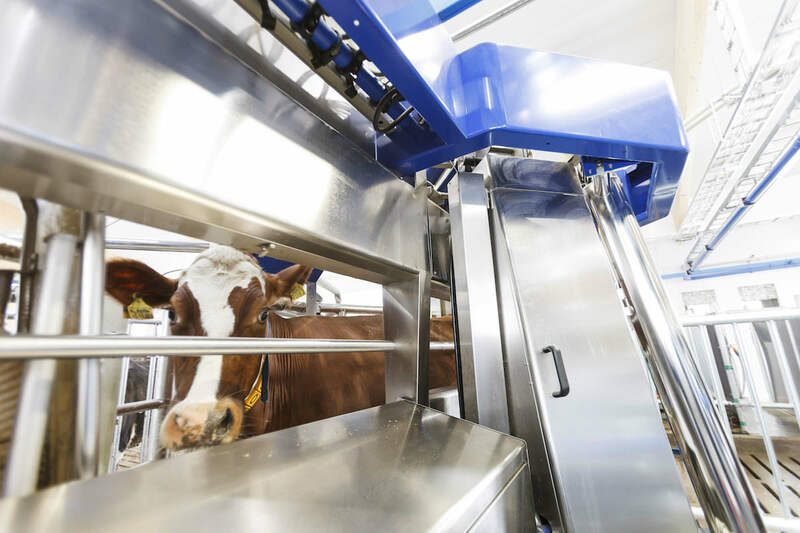 DeLaval International, a large Swedish producer of dairy and other farming equipment, is installing 24 robotic voluntary – meaning the cows approach the stations on their own – milking machines at TDI Farms LLC of Westphalia that will be able to milk 1,500 cows. The new system will be operational sometime next year (no firm date has been set yet), according to Muhieddine Labban, solution manager of automatic milking systems at DeLaval. The farm is owned by the Trierweiler family. They decided to transition to a robotic milking system after seeing improved longevity and lower cull rates of cows in dairy farms using these systems. “For the last few years, my family has been discussing the farm’s next steps. Ultimately, the conversations kept coming back to robotics as we felt it was the best fit,” said Bryant Trierweiler, one of the owners, in a press statement. Here’s how the Voluntary Milking System machine works: the cows are free to come to the machine to be milked as they please, drawn by the feed that is dispensed during milking. Because the animals are creatures of habit, they learn this routine within a few days, says Labban in an email. The system cleans, pre-milks, dries and stimulates each teat individually using water, compressed air and a vacuum. After this preparation stage, the cows are milked via a robotic attachment that scans their underside to detect where the teats are located and checks the milk flow before releasing the suction cup at the end of the milking session. A room full of Voluntary Milking Systems. Image courtesy of DeLaval. According to DeLaval, the VMS is better for cows than traditional milking systems since it has an open structure that allows the cow to see her surroundings and to stand in a comfortable position without human management, which can be stressful for the animals. The VMS also monitors udder health and can detect potentially life-threatening mammary gland infections. Now to the question that always comes up when we talk robots: what about the farm workers who previously did the milking? The Trierweilers say they plan to develop their employees’ skills in other directions in the company. “We have a great core of employees and prefer to develop their talents as opposed to adding more labor,” said Bryant Treirweiler. Labban says the “human element remains a critical factor” and that without a “motivated, competent and committed workforce, it’s impossible to build a successful dairy business.” Robotic milking technology allows for a better trained and more flexible workforce, he says. “Workers can now make better use of their time by handling chores and tasks that are critical to a well-managed dairy operation. The VMS increases efficiency, providing the dairy producer with the opportunity to hire fewer, but higher-caliber trained and qualified people,” he tells Modern Farmer in an email. DeLaval is also involved in the creation in one of the largest robotic milking facilities in the world, which is being constructed in Los Angeles, Chile. El Fundo Risquillo farm will have a total of 64 machines milking 4,500 cows, according to DeLaval. It’s slated to be on line early next year. The VMS isn’t the only robotic milking system out there. GEA Farm Technologies, based in Germany, has the DairyProQ, a robotic rotary system that is in use on two dairy farms in Germany and two in Canada. Here’s a video of the dairy farm in British Columbia using the DairyProQ. Knowing about cows and how robots milk them is really a good knowledge, owing for quality milk and the safety of cows. Expecting this kind of quality blogs in the future, listing out the factors of robotic voluntary milking systems!